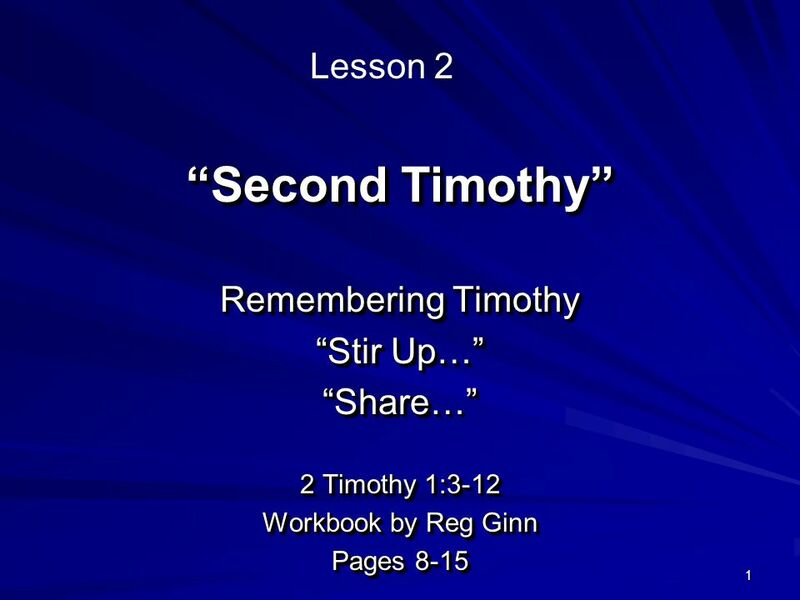 1 “Second Timothy” Remembering Timothy “Stir Up…” “Share…” 2 Timothy 1:3-12 Workbook by Reg Ginn Pages 8-15 Remembering Timothy “Stir Up…” “Share…” 2 Timothy. 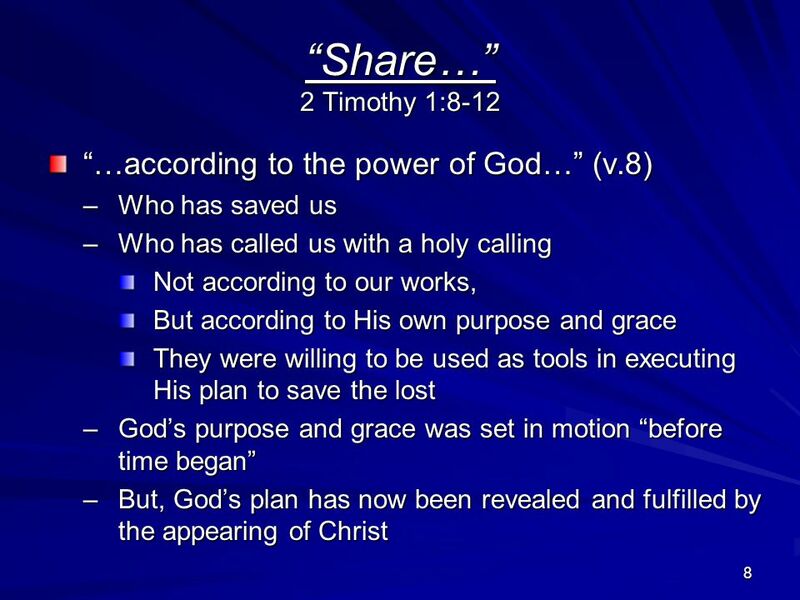 Download ppt "1 “Second Timothy” Remembering Timothy “Stir Up…” “Share…” 2 Timothy 1:3-12 Workbook by Reg Ginn Pages 8-15 Remembering Timothy “Stir Up…” “Share…” 2 Timothy." 2 Chronicles 24:1-2 1 Joash was seven years old when he became king, and he reigned forty years in Jerusalem. His mother's name was Zibiah of Beersheba. A Living Faith in Mother & Child 2 Timothy 1:1-5. New Beginnings 2 Timothy Timothy I thank God whom I serve, as did my ancestors, with a clear conscience, as I remember you constantly in. “The Grace Of God” What Is The Grace of God? Where Is Grace Found? 1 “Second Timothy” “Hold Fast…” “Be Strong…” “Endure Hardship…” 2 Timothy 1:13 – 2:8 Workbook by Reg Ginn Pages “Hold Fast…” “Be Strong…” “Endure. Testimony: Psalms 48 …You rescue me from the violent man. 49 Therefore I will give thanks to You among the nations, O Lord, and I will sing praises to. 2 Timothy 1:1-18. 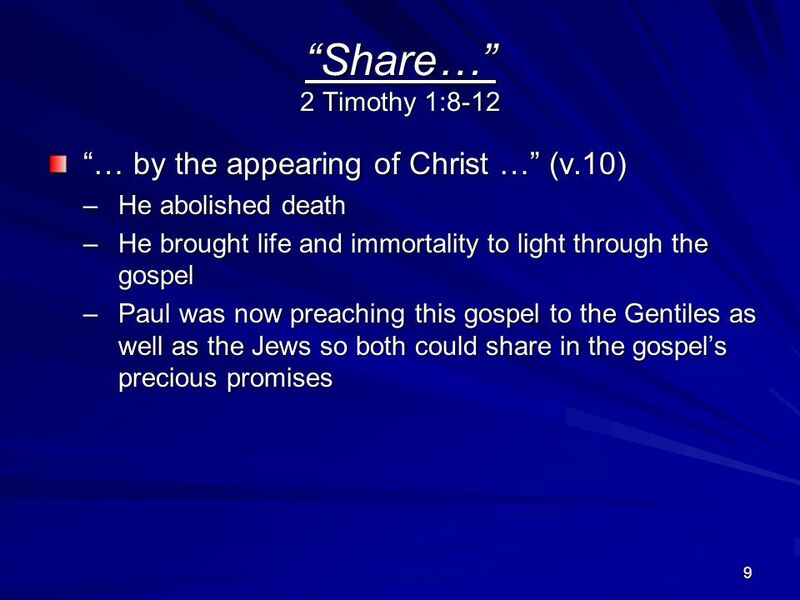 Paul, an apostle of Christ Jesus by the will of God according to the promise of the life that is in Christ Jesus, to Timothy, my beloved. 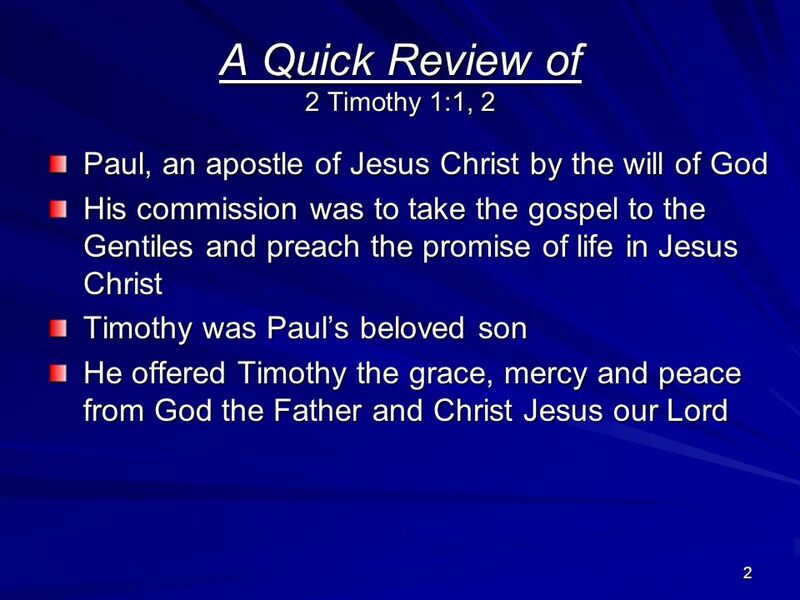 2 Timothy 1: Paul, an apostle of Christ Jesus by the will of God, for the sake of the promise of life that is in Christ Jesus, 2 To Timothy, my. 2 Timothy 1 (page 914) (1) This letter is from Paul, chosen by the will of God to be an apostle of Christ Jesus. I have been sent out to tell others about. Mike Mazzalongo 7 Habits of Highly Effective Christians, Ministers, Elders and Deacons 2 Effective Ministers & Elders. I Want To Help You Find Your Own Flame Pastor Matt Prater. Acts 16:1 He came to Derbe and then to Lystra, where a disciple named Timothy lived, whose mother was a Jewess and a believer, but whose father was a Greek.